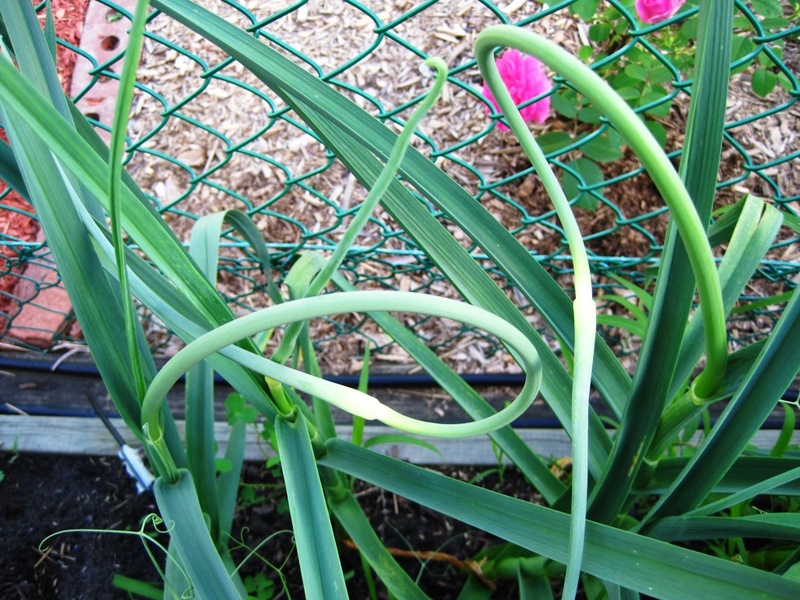 Garlic scapes do loopty-loops in the garden. Last fall, I planted some garlic for the first time. 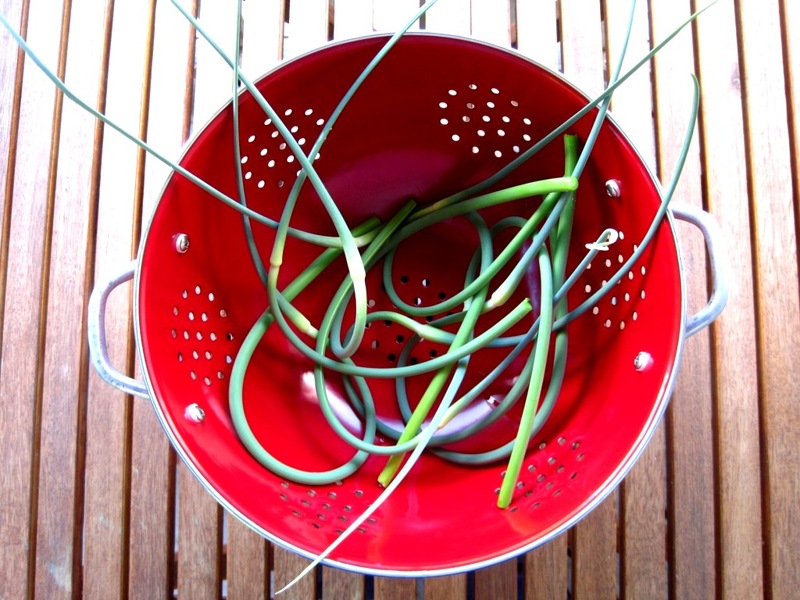 Now it’s 1-2 months to harvest and, until earlier this week, I had garlic scapes doing loopty-loops in my garden. The scape is the garlic bulbs stem which lengthens as the bulb matures. The typical recommendation is to snap off the scape once it’s done 1-2 loops, so the plant’s energy goes into the bulb and makes it bigger. Some garlic gardeners also say that the bulbs will keep better if they’re left to mature without the scapes for the last 1-2 months. Others say, just leave them on. Left on, they would “flower” into bulbils which can be used to propagate garlic. The scapes are edible though, so it was pretty clear to me that I was going to snap them off! How could I miss this culinary opportunity?! I admit, I hadn’t tried garlic scapes until this week, wasn’t even familiar with them until a couple of years ago. Garlic scapes, tender greens for dinner. I snapped all but one scape, which will be an indicator—when the scape straightens out—for when to stop watering the garlic. To fully appreciate how scapes taste, I chopped them into inch-long pieces (discarding the “bulb”), sautéed them in some butter and seasoned with salt: tender greens with a mellow garlic flavour. Now that I’ve had them, it’s reason to grow even more garlic next year.